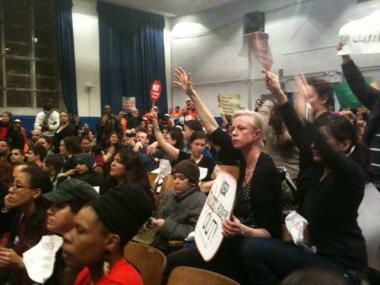 Hundreds attended hearings on Success Academy's South Williamsburg location earlier this year. WILLIAMSBURG — A controversial charter school cleared its latest hurdle in a bid to open in South Williamsburg this coming fall, after a lawsuit filed against the institution was thrown out last week. However, opponents of the proposed Success Academy on South Third Street who filed the suit, which claimed the school did not do enough required community outreach, said they planned to appeal the judge's decision. The booming charter network with nine schools in the city — whose proposed Williamsburg campus drew protests earlier this year — was sued by the Southside Community Schools Coalition, a group of South Williamsburg non-profits, parents and elected leaders. But Judge Peter Moulton of the State Supreme Court said Friday the school did the adequate amount of outreach in his decision to dismiss the lawsuit. "It is undisputed that Success Academy did conduct some outreach in the communities that would be serviced," he wrote in his decision. "Success Academy attended meetings with the relevant community boards and education council, wrote letters to elected officials, and collected petition signatures." Judge Moulton acknowledged the school could have done more in-depth outreach, as the Southside Coalition claimed. "Success Academy could have engaged in a more thorough-going canvass of the relevant neighborhoods of Brooklyn," the judge wrote. "[But] the community outreach required by the statute is weak." The charter network's CEO Eva Moskowitz — who also won another lawsuit last week filed by opponents who claimed the network did inadequate outreach for its Cobble Hill school opening in the fall — bashed both suits as "baseless." Success Academy is also opening a school in Bedford-Stuyvesant in August, and is proposing six more schools in fall of 2013. "Families and their desire for more school options have won out over the special interests," Moskowitz said in a statement about the lawsuits. "In both Williamsburg and Cobble Hill, we found tremendous demand this year from parents seeking a choice when it comes to educating their children." But the coalition's attorney, Arthur Schwartz, said the group only narrowly lost its attempt to sue the school and that he plans to appeal the decision. "They barely made it over the line," he said of the charter's outreach efforts. "What the judge wrote is not an endorsement of their efforts." Schwartz said the coalition would advocate for a change in state law to require more thorough outreach before charter schools open. "We're going to be recommending to the Legislature that they make the community input requirement clearer," he said. Schwartz added that parents are still dismayed over the charter school's plan to co-locate in M.S. 50, a high-needs public middle school where multiple protests were staged this winter. "The parents in that community are up in arms about Success taking over a part in their local schools," he said.